The South is home to the very charming and romantic Battery Carriage House Inn, as well as some of the Battery’s resident ghosts. It sits in the garden of one of the most gracious houses in Charleston. 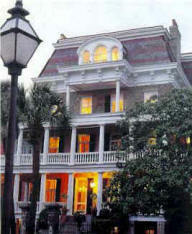 In front of the inn is a 5-story home owned by Stephen-Lathers and is a private residence. 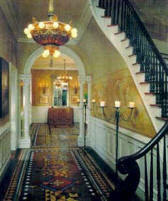 Guests actually stay in the carriage house or on the ground floor garden level. The inn is famous for their two resident ghosts: the headless torso and gentleman ghost. According to the inn’s website the headless torso may have been someone from the civil war period since the house was originally built in 1843 and was an active artillery installation. 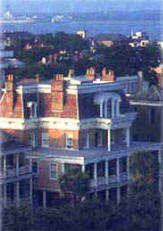 The gentleman ghost was thought to be the ghost of a young man whose family once owned the Battery house. He was a sensitive and cultivated college student who one day took his life when he jumped off the roof. Apparently, there are two main rooms that attract the ghost’s energies, room 8 and 10. There has been a recorded account about the headless torso haunting coming from room 8 in 1992. When an engineer and his wife stayed in room 8, it was only the engineer who experienced the apparition. In the account, they both relate seeing an unusual amount of cats prior to settling in that evening. It was later explained to them that cats can signify an impending visit from a ghost. When they turned in for the night, the husband suddenly felt a presence watching him. He saw a man – that is only the torso of a “barrel-chested” man, no head and no legs. He reports that the ghost had raspy breathing and was wearing a burlap-like coat that once he reached out to touch, felt the gesture angered the ghost. The ghost let out a sort of growl. The husband felt the ghost disliked him and wanted him out. He tried to scream, which he said woke him up. Was this a dream or not? The man believes it felt too real to have been a dream. The other ghost - a less threatening ghost – is the gentleman ghost, so named because he supposedly likes the ladies! There is a story about two twin sisters who went to Charleston to celebrate their joint birthday and stayed at the Battery in room 10. Only one twin experienced the ghost (darn!) After retiring one evening, while one twin slept the other noticed, a "wispy, gray apparition that appeared to be floating through the closed door, through the chair, and into the room." The ghost eventually came over towards her and laid down and put its arm around her shoulder. The woman wanted her sister to notice the spirit. Only once the other twin awoke, did the gentleman ghost disappear. The ghost got the nickname the "Gentleman Ghost" because he has done that before.